We travel by car a lot. It suits us and our frugal lifestyle. It is cheaper than flying and when we get to our destination we don't have to rent a car. Since we are on a retirement budget now we really have to find the most economical ways to do things. 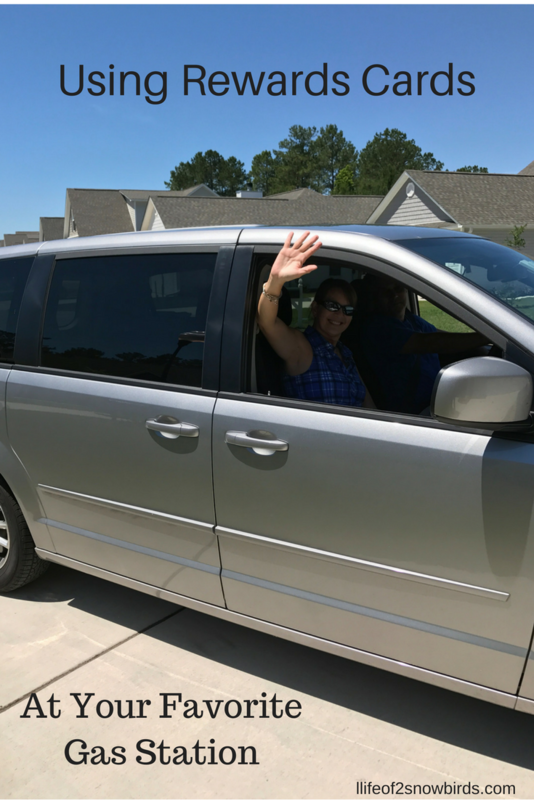 Sometimes we are driving to a vacation spot but most likely we are either traveling 10 hours to our snowbird home in Florida or traveling 10 hours to visit our family and friends in New York. We stop a few times along the way for gas and coffee. 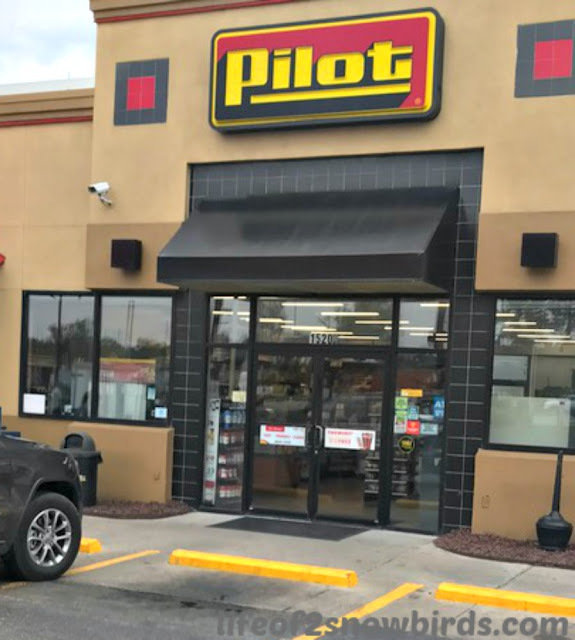 We've done these trips so many times now that Soko knows which exits in each state we need to get off to get to our favorite gas station, Pilot Flying J! We started looking for Pilots because we noticed that they always seemed to price their gas a few cents less than the other gas stations. Exit 104 off I95 in Virginia is where the Pilot station with the cheapest priced gas on our route to NY is located. On our way to Florida, we'll stop at the one in Florence, SC. for the best price. Usually a lower gas price would be enough for us to be loyal to a gas station, but now we have discovered more reasons to stop here. 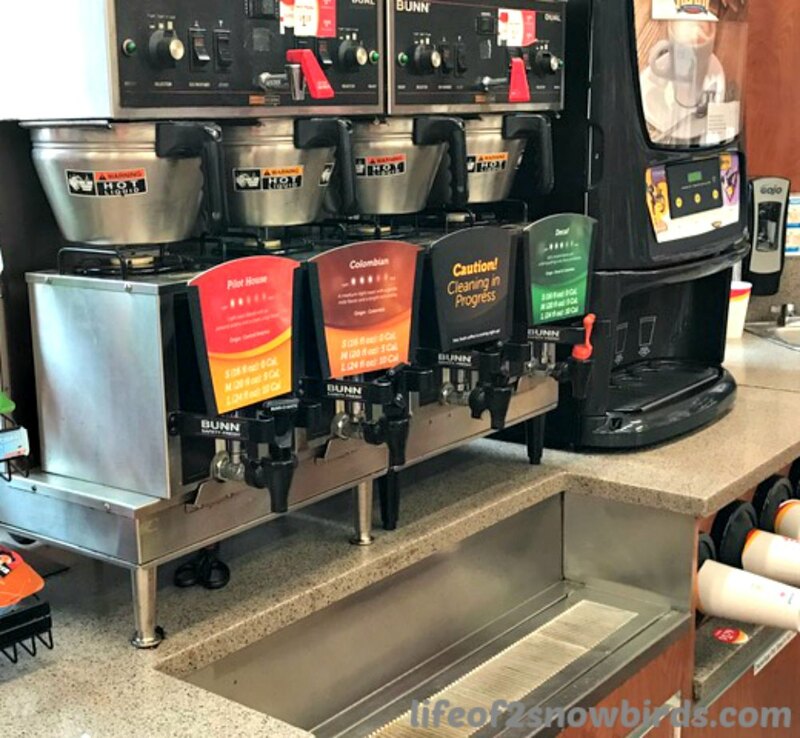 Awhile back when we stopped for gas, coffee and to use the restrooms, which are always clean, we noticed that they sold a large 20 oz. coffee mug. The sign said that this mug could be used for refills that will only cost $1.19. Without the mug, a 20 oz. coffee costs $1.79. 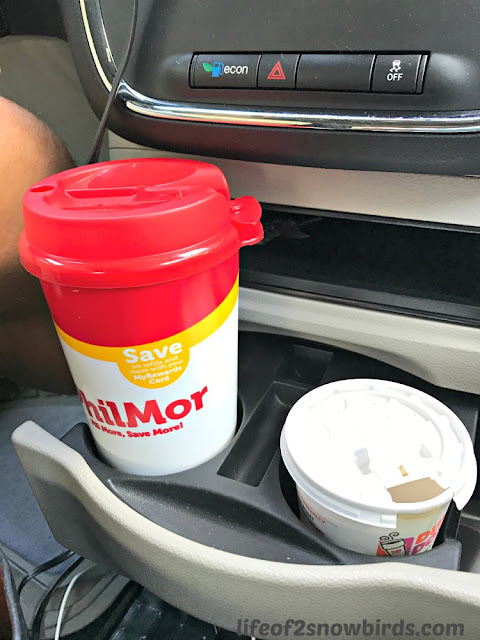 We could save 60 cents every coffee stop! On an average trip to NY Soko will stop 2 - 3 times for coffee. I will usually only join him once during the trip. If Soko drinks 3 cups of coffee we save $1.80. That pays for my coffee making my coffee free! The initial cost of the mug is $2.99 which is $1.20 more than a 20 oz. coffee costs but it definitely pays for itself after only a couple of coffee stops. 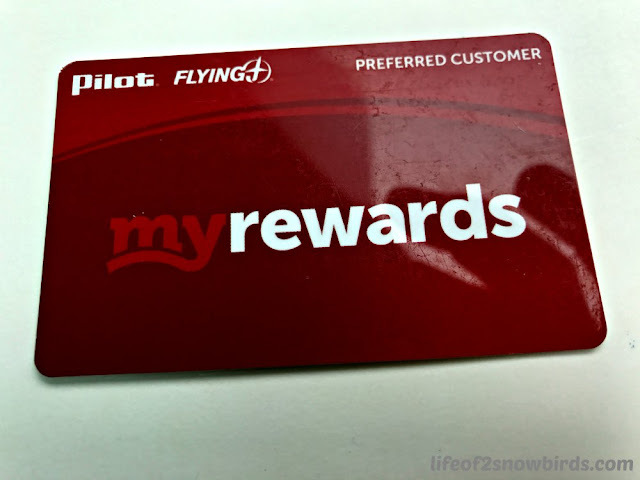 Pilot's great coffee deal gets even better if you have their rewards card. (You can get a card simply by asking the cashier for one). We just give the cashier our card when we pay for our coffee and he/she updates it to include the one or two cups we just purchased. Then we get a free 10th cup of coffee after we buy 9. On a recent road trip we actually got our two coffees for only $1.08 total. We were not sure why though so I researched and found out that they often have weekly deals for card holders. Soko's coffee must have been free (his 10th cup) and my small $1.49 coffee was probably the weekly deal. It was a pleasant surprise for sure! Last, but not least, we are now getting 3 cents off a gallon when we use our rewards card. This just happened on our last road trip. Before Soko started to pump the gas it asked if he had a rewards card. Then all he had to do was insert the card the same way he would our credit card and we got the reduced price. It was that easy! There are other gas stations that have similar deals, like Wawa for one, so definitely check with your favorite station. 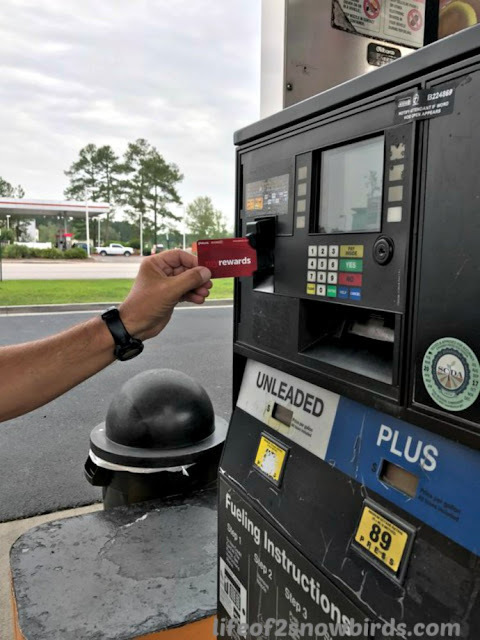 We signed up to join the rewards club with BP, our neighborhood gas station, and was earning cents off the price of gas but for some reason it is not working anymore and we haven't checked it out to see why. If you like to live a frugal lifestyle like we do and get excited about saving money any way you can, you will love using your gas station reward card! I admit I do lot of driving but it is locally and the unfortunately the closest pilot is 13 miles away. Bummer for me! But at least you talked me into trying their coffee, the next time I do pass by one. Thanks! Check with your local gas station. They may have a rewards card!